Coming off a strong season last year, the industry is looking to 'build on the momentum' and capture more of the growing numbers of tourists visiting Maine each winter. Black Mountain’s Angry Beavers created four new glades. 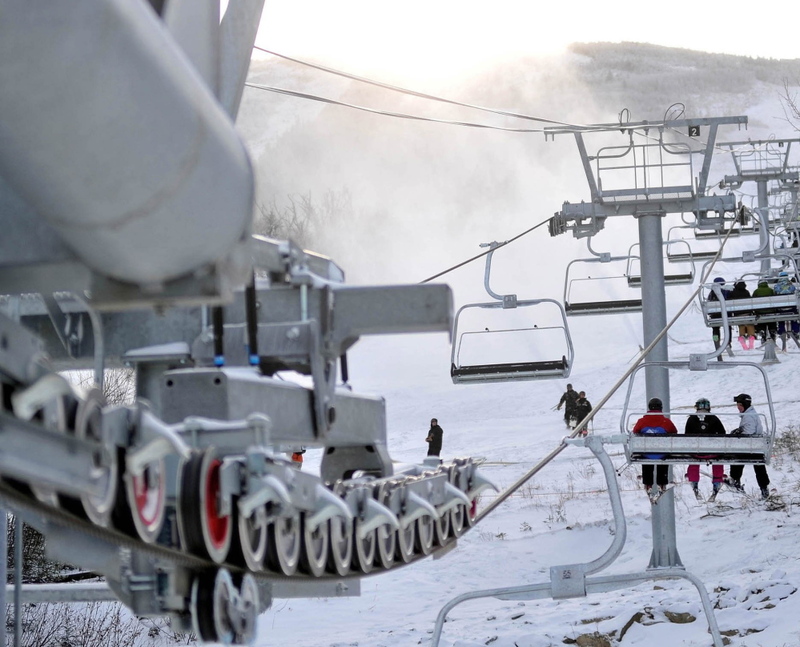 Sugarloaf spent $250,000 on a pair of snow machines that open up back-country terrain for an experience it says can’t be found anywhere east of Michigan. Sunday River Resort skiers are already riding its first new lift in nine years and its Christmas week bookings are up 44 percent over this time last year. 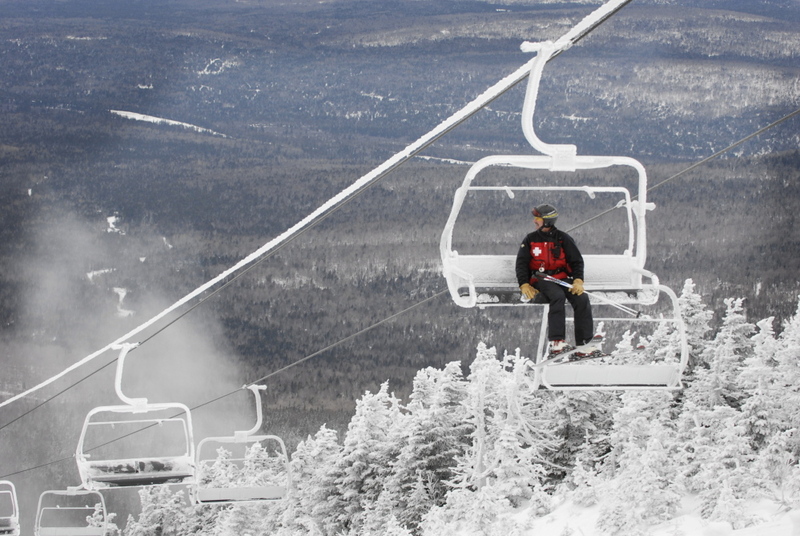 Another ski season’s here with great investment – $4.7 million at Sunday River alone – one great unknown (Where art thou, Saddleback?) and the industry’s trademark optimism. It’s the first time in Greg Sweetser’s memory that two Nordic centers and two Alpine slopes were open and skiing at the end of November in Maine. “That’s an optimistic sign and gotten buzz among skiers, ‘Wow, there’s both cross-country and downhill already,'” said Sweetser, executive director of the Ski Maine Association. He’s watching the jet stream, talking to meteorologists, monitoring snowpack in Canada and hoping Farmers’ Almanac got its predictions right. Portland received 95.2 inches last winter, more than 50 percent above the historical average. That led to a good season for most resorts and just under 1.3 million skier visits, the average for the past three years, Sweetser said. Ski Maine estimates skiing’s economic impact at $300 million. The Maine Office of Tourism is looking to up that this winter by more than doubling the outreach of its advertising, according to spokeswoman Jennifer Geiger. Geiger said the office is looking “to build on momentum.” Winter visits to Maine have increased 7 percent each of the past five years. One-third of those visitors are looking to head outside. Look for: Four new glades, new snowmaking on the lower half of the Allagash Trail, a repainted lodge and newly town-paved roads leading to and from the mountain. Volunteers known as Angry Beavers spent more than 500 hours over the summer creating the new glades and cleaning up existing ones, according to spokeswoman Deanna Kersey. Two trails, Moxie and Bagaduce, were also de-stumped. The nonprofit mountain has more than 50 glades and trails at capacity. Glades in particular have been getting more popular there for cross-country skiers. Look for: Improved snowmaking and vastly improved parking after construction crews dug up a foot of clay throughout the main lot. “They’ve improved the parking lot 100-times-fold,” said Frank Chin, assistant manager at the nonprofit, volunteer-run mountain. He hopes to see the ski hill open with part of the main trail and part of the bunny slope. Titcomb has 20 trails at capacity. Look for: Three new trails, a new kitchen, new rental equipment and the addition of Lost Valley Brewing. John Herrick, its new general manager, came on this fall. Strong early-season pass sales have him hoping skiership is up this winter on its 18 trails. The ski area plans an open house/launch party on Dec. 14. Look for: A new Magic Carpet lift in its beginner area, the first full season of the mountain’s new Winch Cat and a lot of celebrating its 80th anniversary. The Winch Cat, a groomer with a cable to anchor itself, came online at the end of last winter, according to Rachael Wilkinson, marketing director. Skiers make a run at Shawnee Peak in Bridgton last year. The mountain, celebrating its 80th anniversary, has a new “Magic Carpet” lift in its beginner area to relieve congestion. The Magic Carpet, its second surface lift in the beginner area, will help with congestion. At capacity, that mountain has 40-plus trails and glades. Look for: Reconfigured lodge space with more seating capacity, a new seasonal locker room, new weekly rail jam snowboard competitions and a new alpine center. Spokesman Uel Gardner said the Norway Savings Bank Alpine Center, under construction this week, will have space for coaches to meet with athletes on the first floor and second-floor space for timing and event announcements. Mt. Abram has 48 trails at capacity. Gardner’s anticipating the snowboard competition to be a popular draw, potentially luring talent from as far away as Portland. The mountain has a new general manager this winter, Bob Harkins, a former U.S. Ski Team coach and one of the founders of Cold River Vodka. Look for: Upgrades in snowmaking efficiency, improved snowmaking on Skidder Trail and its new “cat skiing” operation on Burnt Mountain. The new Skyline lift at Sugarloaf is shown during the winter of 2011. It replaces the Spillway East lift that derailed Dec. 28, 2010, injuring at least six and left dozens more stranded in frozen suspension. The cats are a larger version of a snow-grooming machine with a cab that fits up to 12 passengers, according to spokeswoman Noelle Tuttle. In “cat skiing,” skiers will hop in for a 20-minute ride along a newly cut half-mile road on the eastern side of Burnt Mountain, a trip that used to take an hour on foot. Parent company Boyne Resorts invested $250,000 for the new rides and skiers will have to pay an extra fee to use them. 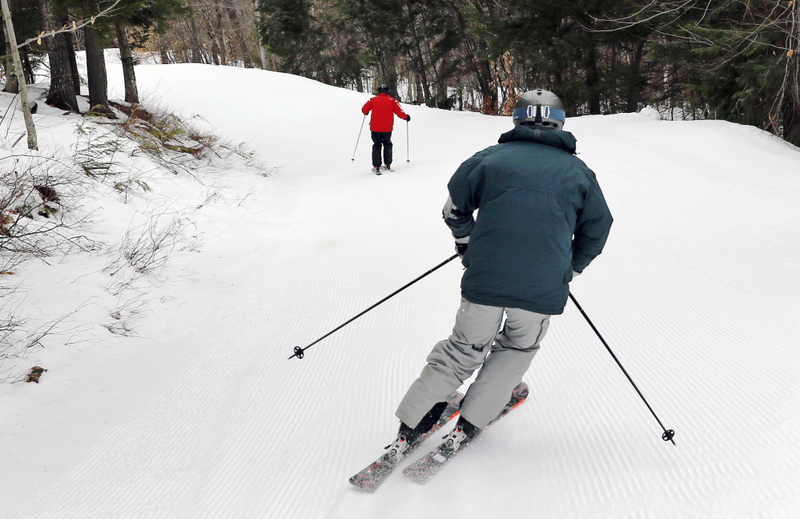 Sugarloaf has more than 160 trails and glades at capacity, the largest number for a Maine mountain. Look for: $4.7 million in capital investments from Boyne Resorts that include the new Spruce Peak Triple chairlift, a new beginner trail with 8,000 feet of snowmaking and a massive deck expansion at The Mountain Room restaurant. The chairlift, the resort’s first new lift since 2008, is capable of carrying 1,480 skiers an hour at 500 feet per minute, according to spokeswoman Darcy Lambert. The new trail this season, Bear Paw, was cut on Locke Mountain in a partnership with Gould Academy in Bethel. Bear Paw is expected to move beginner traffic away from the Monday Mourning Trail, the dedicated race trail on the mountain. “It’s really kind of a fun switchback trail – beginners are going to like it because it’s the easiest way down,” Lambert said. At full capacity, with 15 chairlifts, Sunday River has 135 trails. It’s the most-visited ski mountain in Maine. Season pass sales are up 20 percent year-to-date. November lodging was up 28 percent over last November. Target opening: A big question mark. The resort’s website last week said simply, “Alpine skiing and snowboarding … the way it should be” with links to an old Q&A and press release. This past week, management deferred comment to a Majella spokeswoman who didn’t respond to requests for comment. The Sun Journal also reached out to Spruce Mountain but didn’t hear back from officials.